The Scientific director of the Center is Dr. Konstantin V. Krutovsky, Leading Scientist, N.I. 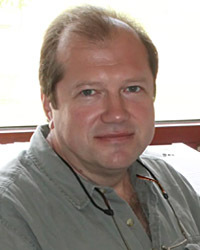 Vavilov Institute of General Genetics, Russian Academy of Sciences; Professor of Texas A&M University (USA) and the University of Göttingen (Germany). My primary research interest is in understanding the genetic control of complex traits that define adaptation and response to environmental stresses in conifers, as well as traits of practical value, such as wood quality, growth, and disease resistance. Conifers have significant economic and environmental importance, and a remarkable evolution. I use cDNA libraries, genomic and EST nucleotide sequences to discover alleles in genes controlling important adaptation and mitigation traits that enable future tree breeding strategies. I collaborate on the Douglas-fir Genome Project (DFGP) and the Loblolly Pine Genome Project (LPGP) to find candidate genes for adaptive traits and to use association mapping for identification of the specific loci and alleles that are responsible for phenotypic differences in adaptive traits. I use high-throughput sequencing and genotyping and population genomic approaches to analyze structure of natural and breeding populations of Douglas-fir and loblolly pine and actively participate in the Coordinated Agriculture Project (CAP) "Integrating research, education and extension for enhancing southern pine climate change mitigation and adaptation" (PINEMAP) recently funded by the USDA National Institute of Food and Agriculture (NIFA). Koralewski, T.E., Brooks, J.E. and K.V. Krutovsky, 2014 Molecular evolution of drought tolerance and wood strength related candidate genes in loblolly pine (Pinus taeda L.). Silvae Genetica 63(1-2): 59-66. Chhatre, V., T. Byram, D.B. Neale, J.L. Wegrzyn, and K.V. Krutovsky, 2013 Genetic structure and association mapping of adaptive and selective traits in the East Texas loblolly pine (Pinus taeda L.) breeding populations. Tree Genetics and Genomes 9(5): 1161-1178. Krutovsky, K.V., J. Burczyk, I. Chybicki, R. Finkeldey, T. Pyhäjärvi, J.J. Robledo-Arnuncio, 2012 Gene flow, spatial structure, local adaptation and assisted migration in trees, pp. 71-116, Ch. 4 in Genomics of Tree Crops, edited by R.J. Schnell and P.M. Priyadarshan. Springer Science, Inc.